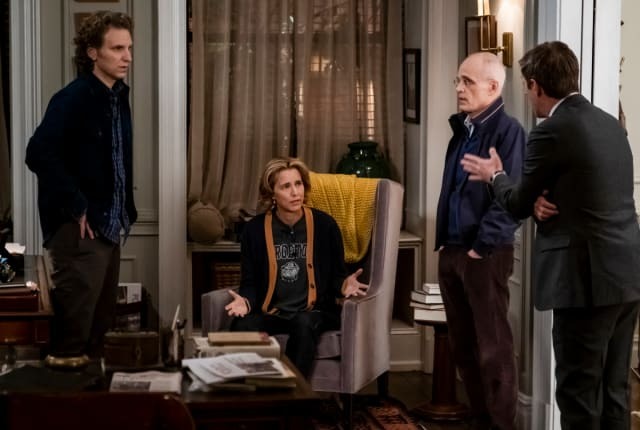 On Madam Secretary Season 5 Episode 19, Elizabeth must deal with the fallout from a rumor that she and Dalton had an affair while also dealing with an international crisis. Madam Secretary Season 5 Episode 19 examines the way the ugliness of political campaigning might affect Elizabeth and her family. Everyone is excited when she discusses her run for President with her staff, but then Russell shows up with bad news: an article is about to be published suggesting Elizabeth had an affair with Dalton 20 years ago. Mike B thinks she should ignore the article while Jay thinks she should respond to it. Meanwhile, there is an international crisis to be dealt with. China is sellng private jets to Mynamar, which is attacking its own people, and Elizabeth's desire to sanction Mynamar causes China to back out of the climate migration accord. Elizabeth wants to label Mynamar's actions as genocide, but that requires Dalton's approval. Meanwhile, Nina is reluctant to work with the new acting Secretary of State because she's heard rumors that he engages in sexual harassment but doesn't want to get him in trouble if it's not true. And Elizabeth has a new dilemma to deal with when both political parties want her to run on their ticket. To find out what happens, watch Madam Secretary Season 5 Episode 19 online. On Madam Secretary Season 5 Episode 19, Elizabeth must deal with the fallout from an article alleging she had an affair with President Dalton during her CIA days.